On April 8, 2009 Charles Communications team worked in conjunction with the staff at DeLoach to host a Passion for Pinot Fireside Chat to commemorate the release of Jordan Mackay's book, Passion for Pinot, A Journey Through America's Pinot Noir Country and to solidify DeLoach as a preeminent pinot producer in the Russian River. The event was a great success with attendance from both the wine trade media, sommeliers and growers. As the event was away from San Francisco, many invitees had expressed their sincerest apologies for their inability to attend the event. The event featured a panel discussion, in which Jordan asked a series of questions regarding pinot noir and winemaking to a group of panelists consisting of Brian Maloney of DeLoach, Dan Goldfield of Dutton-Goldfield Winery, Adam Lee of Siduri Wines and Michael Browne of Kosta Browne Winery. 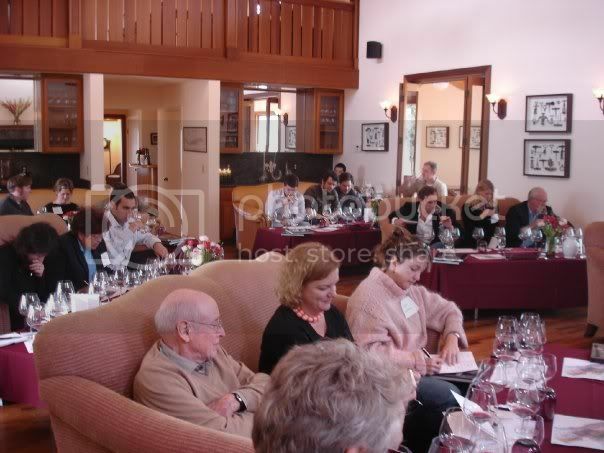 The layout of the event consisted of causal sofa seating, but with a formal tasting mat to highlight each wine, and was very much conducive to encouraging audience participation. Prior to the discussion, Jean-Charles welcomed everyone to DeLoach and introduced the concept of the afternoon. Jordan introduced the panelists and a freeform discussion followed on: trends of single clone production, changing styles of pinot noir in California, reactions to critics and writers on the trends of pinot noir, site specific challenges and accomplishments in growing pinot noir and the solidarity of the panelists love for the grape. 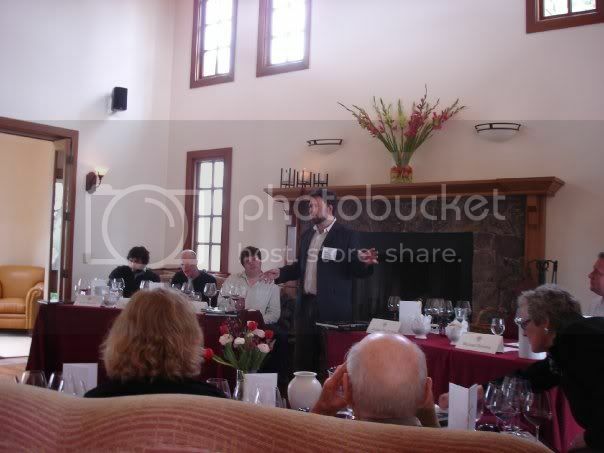 Six different wines were tasted during the course of the event. As guests arrived at the DeLoach guesthouse at 3 p.m., they were offered four different wines from the Russian River Valley from the wineries participating at the event. Once the discussion was underway, the guests were poured wines from four different appellations, and the winemakers were given a chance to discuss the select wines being poured. We purposely requested that each winemaker bring a wine from different and unique AVAs to showcase not only Russian River, but also the nuances of terroir and how it affects this varietal. Overall, the event went very well. We received numerous comments on the appealing layout and style of the event. Attendees appreciated the casual fireside set up and earnestness of the winemakers' discussions. We also received a number of comments on how nice the DeLoach Guesthouse was and the hospitality that they received while there. Press was interested and happy to familiarize themselves with the DeLoach pinots, and we were told by some press that they were not familiar with the extensive pinot noir program that was in place at DeLoach. The wines showed very well and allowed attendees to catch a glimpse of the talent of the winemaking team at DeLoach. Thanks to everyone at DeLoach who helped on this project. We really appreciate it!